Bureaucrat-turned-farmer Sim Oyra is Bashkortostan’s watermelon pioneer. 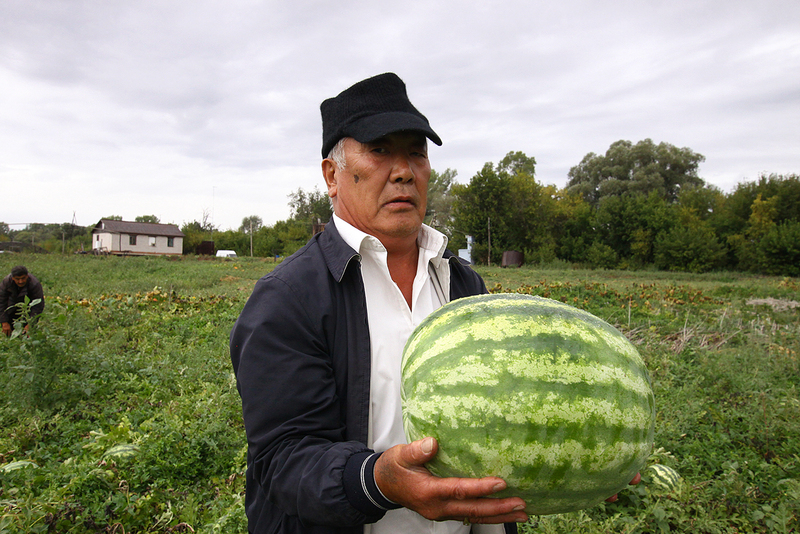 63-year-old farmer Sim Oyra learned how to grow South Korean-origin watermelons in difficult climatic conditions on the Europe-Asia border. Sim Oyra grows big and sweet watermelons in the Russian internal republic of Bashkortostan, a large mainly Muslim region that is 1,000 km east of Moscow. A South Korean flag adorns the wall of his house, an edition of ‘Korean News’ is visible on his coffee table, and his garage boasts of a Hyundai Equus luxury sedan. “I'm an ethnic Korean, who grew up in Uzbekistan, but my soul is Russian,” he says. Sim Oyra insists that his friends and acquaintances call him Oleg to avoid the difficulty that comes with pronouncing a name that is unusual in Russia. Sim Oyra will turn 64 this year. He was born and raised in Tashkent. His ancestors left the territory of modern Korea in the late 19th century and settled in the Russian Far East. His mother grew up in Khabarovsk, while his father was raised in Ussuriysk. In 1937 his family was deported by Joseph Stalin’s regime to Uzbekistan. In Tashkent Sim Oyra was trained as an economist and joined the main Central Asian water department, where he gradually rose to the top position. “As per Soviet standards, it was equivalent to the post of the Deputy Minister of Agriculture,” he says. After the collapse of the Soviet Union the family moved to Bashkortostan, where his wife's relatives lived. Sim Oyra, who is a Russian citizen, says he did not encounter ethnic discrimination when he started his business in Russia. He adds that Bashkortostan is the home of many ethnic groups such as Tatars, Bashkirs and Russians. In the early 1990s, the ethnic Korean leased 100 hectares of land near Bashkortostan’s main city Ufa, where he grew vegetables that are traditionally harvested in the region- potatoes, dill, parsley, and cabbage. He named his farm Koreana. In 2014 he decided to grow something unprecedented for that part of Russia - watermelons on a commercial scale. Sakata company seeds were ordered from South Korea. “The variety I picked up is specifically tailored to the soil characteristics and weather conditions of this area,” says Sim Oyra. On the two hectares allocated for plantation, 16,000 seeds are needed. “My expenses for a season work out to about $11,000, not counting the salaries of 20 workers, utilities and rental equipment,” he says. Every seed yields about 40 pounds of watermelons during the season. A season on the farm brings around 80 tons of watermelons. The melons are sold for 15 rubles (around $0.25) per kg in shops and at fairs in neighboring cities. The farmer also gifts watermelons to orphanages and friends. How did he manage to succeed, given the fact that Bashkortostan is much colder than Uzbekistan, which has a sub-tropical dry climate? Sim Oyra gives credit to the technology he used: the seeds are covered with cling film, and grown without air. Holes in the film are made only when sprouts get stronger. Melons are watered centrally, at the root, which significantly increases yields, he adds. The farmer says the technology enables watermelons to be grown in temperatures of 18 degrees Celsius. The appearance and taste do not differ from melons grown in traditionally warm regions. Local supermarkets first agreed to take watermelons reluctantly, but now they compete to buy his produce. The ethnic Korean farmer’s melons are in such high demand that shops even try to pass off imported watermelons as Sim Oyra’s at times. After talking about watermelons, Sim Oyra switched to his favorite topic: How to bring his two large homelands closer – Korea and Russia. In the village of Bulgakovo, where his farm is located, he opened a Korean Cultural Center with his own money. He also wants to open a Korean school, start exchange programs and organize Korean language lessons for people from all communities. Although his parents taught him Korean, Sim Oyra rarely speaks the language. What linked Kim Jong-Un's elder brother Kim Jong-nam with Moscow? Sim Oyra also wants to help build business ties between Russia and South Korea. In addition to plans to open a joint Russian-Korean enterprise for processing of agricultural products, he wants to invite large Korean conglomerates to set up shop. Most of his family members have moved to Moscow. Sim Oyra’s children run their own businesses, but the enterprising ethnic Korean hopes that they will help him expand his business both in Moscow and Bashkortostan.